0 Comments Published by KL Ocs Kid on Tuesday, September 4, 2007 at 12:39 AM. There has been a lot of activity on Liverpool's behalf in the transfer market in the summer and we wanted to refresh your memories how Liverpool has done in the market in recent years. 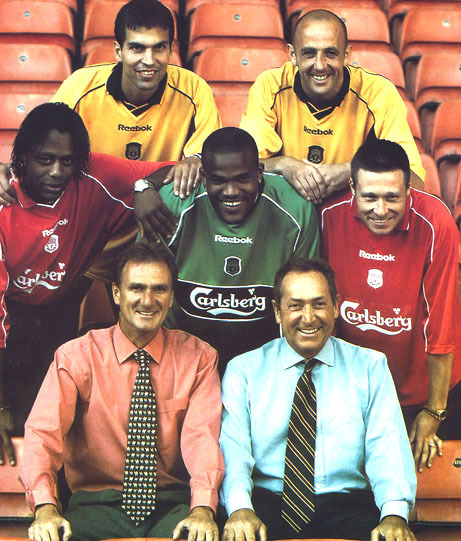 Liverpool's summer signings in 2000-2001 raised more than a few eyebrows. Nick Barmby was the first player since David Hickson to be transferred from Everton to Liverpool and Gary McAllister was seen as probably way past his best at 35. The six players that arrived to Liverpool in the summer played on average only 43 games for the club. Pegguy Arphexad, 6 games. A cover for Westerveld that hardly inspired confidence in his defenders. Markus Babbel, 73 games, 6 goals. Babbel had a brilliant debut season. His Liverpool career was wrecked by Guillan Barre syndrome. "As a kid, I was always watching Liverpool on television in the great times of the Eighties. It was always a dream for me to play in England. I never thought about Spain or Italy. It was mainly the tremendous atmosphere I wanted to experience. I had a taste of it in Euro `96 when I was over here with Germany, and the German players who have played in England always came back and told us amazing stories about the crowds and the buzz you get in the stadiums." - Babbel on signing for Liverpool. The relationship between Houllier and Babbel soured after the German was trying to get his career back on track after his sickness. "I doubt he will play for us again because I gave him many chances and it hasn't worked out. The staff have been disappointed with Markus' attitude towards the club and the fans. It is not only the outburst during the Worthington Cup, but he has been sent off twice in the reserves. I took no action after the first incident but I will fine him two weeks' wages for the incident last week, which was unacceptable. He is no longer in my plans. I think the club has been very fair to Markus. We stood by him and handed him a new contract. I'm very disappointed with him." - Gerard Houllier in 2003. Nick Barmby, 58 games, 8 goals. A player had not been transferred straight from Everton to Liverpool for about forty years! Barmby had one good season at Liverpool, but then lost his form and only lasted two years at Liverpool. "I hope people will understand I'm just like any other football fan who dreams of the chance to play for the club he supported as a boy. I know the tension is high and I know all about the rivalry between the two clubs. I did spend four years at Everton after all. I can't avoid the implications of the move but all I can do is just get on with it." - Barmby couldn't resist the lure of Liverpool. "If you ever watch that treble video back again, you don't realise until you watch it the impact he had on that season, definitely before Christmas, the amount of goals he scored. He was a great help in us winning those trophies." - Jamie Carragher on Barmby's impact during the 2000-2001 season. Bernard Diomede, 5 games, 0 goals (did score with an overhead kick vs. Sunderland that was wrongly not given). World Cup winning winger whose career never took off at Anfield. "He's been very unlucky. I brought him here to give us some width, but then he got injured and, by the time he'd got himself back to fitness, the team had moved on. I still want us to get out wide more, which is why I was keen to sign Damien Duff last summer. But I don't think it's just a case of sticking two wingers on the flanks. It's a team thing." - Gerard Houllier. Gary McAllister, 87 games, 7 goals. The signing of Gary Mac took everyone by surprise but he certainly delivered! "There was a time when I went into training and we were off to Rome, then on a jet to Cardiff for the League Cup final, then Barcelona, then Portugal, then down to qualify for the Champions League at Charlton. That's what you come into football for, to be involved in the best games against the best players where there's a lot at stake. It was magic." - Gary Mac in 2004. One week into the 2000-2001 season Liverpool added the experienced Christian Ziege to his squad. Christian Ziege, 32 games, 2 goals. A veteran international for Germany who featured 72 times for his country, a two-time title winner with Bayern Munich, and winner of Serie A with Milan. Ziege was certainly an experienced player when Houllier decided he would be the man to fill the left back position. Arriving in a blaze of controversy from Middlesbrough which claimed Liverpool had made an illegal approach for the player. No one questions his potiental to deliver pin-point crosses but something seems to go wrong when a big club comes in for him, having also experienced difficulties adjusting at Milan. Ziege only stayed one year at Liverpool, hardly worth the trouble it took to get him to the club. Ziege is the currently the director of football at Borussia Moenchengladbach where still remains a great friendship between the two clubs since they met in the European Cup final in 1977.